Where adolescent girls of the 1980s had John Hughes' idyllic oeuvre and those of the 1990s had Jack and Rose's brief descent into the Atlantic, today's female teens and pre-teens have the supernatural exploits of Bella and company. Identifying with big-screen romance is a natural and normal part of adolescence, for both boys and girls (despite the fervent denials of boys everywhere.) This will always be the case. However, Leonardo DiCaprio never told Kate Winslet that he kind of wanted to kill her. And Sixteen Candles did not contain any terrifying stalking sequences. Many teenage girls are mature and thoughtful, and capable of taking Twilight for what it is; sadly, many are not. And to the young, the naïve, and the impressionable, Twilight is a dangerous, dangerous film, the basic message of which is simply this: abusive relationships are the purest forms of romance. According to the Mayo Clinic, the following actions from one partner to another are domestic abuse, and dangerous warning signs of violence to come: keeping the partner away from work or school; preventing the partner from seeing family or friends; attempting to control where the partner goes and how and when the partner spends money; acting jealous and accusing the partner of unfaithfulness; threatening violence; blaming the partner for violent or abusive behavior; and, of course, committing physical violence. Edward engages in literally all of these behaviors towards Bella; some with intense frequency. In the course of the first Twilight film, he follows Bella around town, breaks into her house, looms over her in her sleep, confesses his desire to kill her, makes it clear that he could kill her at any time, segregates her from family and friends, and forces her from one place to another. In the second, he abruptly leaves her, abandons her in the middle of nowhere, reappears sporadically to tell her what to do, attempts to prevent her from making new connections (and certainly from moving on romantically,) and – most critically – threatens to kill himself for the lack of her. Bella, no role model herself, engages in any number of complacent and self-destructive behaviors for the love of Edward, most notably putting herself in dangerous situations so that he will rescue her. These are the actions of a dangerously unstable and suicidal abused woman, not those of a romantic heroine. 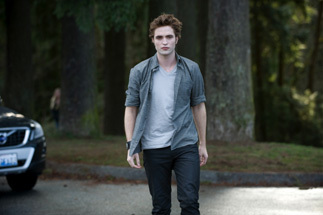 Edward is simply a terrible, violent, abusive person; Bella is a suggestible, weak, and emotionally battered woman. Their relationship, if removed from its supernatural context, would be a sad tale of a violent coupling, one that could certainly prove fatal to one or more partners; apparently the ghouls-and-mystery sheen that Stephenie Meyer has painted over her books obscures the facts of this relationship from view, but that gloss does not change the violent nature of Edward and Bella's romance. There can be no claim that Twilight is not influential, or that it has no affect on its viewers and readers. We are socialized, in part or (sadly) in whole, by media. None of us can deny modeling our dreams of romance and social acceptance off of what we saw in movies and on television as adolescents; as teenagers, we take what we see on the big or small screen and apply it to our lives. Books, music, video games, theater, whatever the source of fiction may be, it influences us, and we accept it as a form of truth. At a certain point, most of us can work out the lessons and messages of a piece of media and separate it from reality; there's nothing wrong with a mature, adult Twilight fan. Very few adolescent girls, however, have yet gained this ability; it is beyond the capacity of a starstruck 13-year-old to discern what is positive and negative about Bella and Edward's romance. The danger, here, is clear. Young girls are forming their opinions of profound, important romantic relationships off of one of the most terrible, abusive examples ever put to film. Twilight says to young women that being stalked by your boyfriend is okay. It says that if he's telling you where to go and who to see, it's because he loves you (and knows best.) It says that, even if he lets you know that he's capable of hurting or killing you, you should put your trust in him, at all times. And it says that if he leaves, you need to do whatever you can – including putting yourself in danger – to get him back. A generation of young girls will not have the tools to discern abuse because all of the warning signs have been normalized and approved by their favorite film. This will lead to violence against women. I am normally not one to say that violent behavior can be blamed on the media, but when something has messages as insidious and destructive as those in Twilight – and when those messages are being delivered to a definitely impressionable audience – the creators are very culpable in the violence to follow. Stephenie Meyer and the Twilight filmmakers have taught a lot of terrible lessons, and will continue to do so; hopefully, parents and educators will have the patience and foresight to undo that damage.